What team does Cristiano Ronaldo play for? The answer is easy: The Spanish giants, Real Madrid. Cristiano Ronaldo current team is Real Madrid, but the story started a long time ago, when CR7 started playing football on his homeland, Madeira, in Portugal. Ronaldo first club was during his youth career, which started in 1993, when he was only 8 years old. He joined Andorinha, a small local club where has played for 2 years. In 1995, Cristiano Ronaldo had his first team change, when he got transfered to Nacional da Madeira, one of the island biggest clubs. Ronaldo played there for about 2 to 3 years, before taking the decision for his first big challenge of his life: leaving the island and his family behind, to move to Sporting Lisbon while being only 12 years old. As many other youngsters in Portugal and all around the World, Cristiano Ronaldo learned the meaning of the word "sacrifice" at a very young age. Being alone in the mainland and forced to live all by himself, allowed Cristiano Ronaldo to build a strong character and go after his dream: becoming a professional football player. His talent did not go unnoticed and he became the only player in the club to have played in all the youth cathegories (under-16, under-17, under-18) as well as the senior ones (B-Team and first team), all in the same season. Cristiano Ronaldo league debut took place in the 7th of October, 2002, against Moreirense and he scored 2 goals. One of the turning points in Cristiano Ronaldo's career has to be a friendly game between Sporting CP and Manchester United, that took place in the summer of 2003, to inaugurate the "Estádio José de Alvalade" stadium, in the Alvalade XXI facilities (Sporting CP property). In that game, Cristiano Ronaldo showed the World the fearless player that characterizes him even today, by taking every defender without hesitating and leaving everyone from Manchester United mesmerized with his speed, skills and technique levels. Sir Alex Ferguson confirmed later that Manchester United players got so impressed when they faced Ronaldo that they strongly recommended to buy him as soon as possible. That would happen just a few weeks later and Ronaldo would become the first Portuguese to wear the Manchester United jersey. 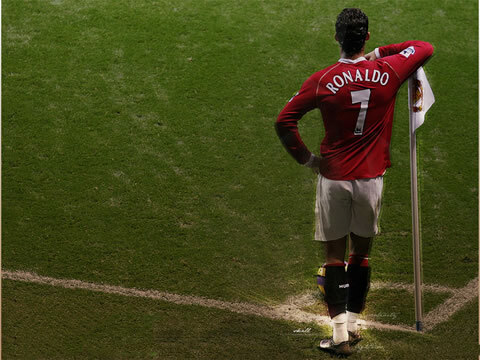 Cristiano Ronaldo had a glorious career in Manchester United, winning several major titles such as 3 Premier Leagues (2006-2007, 2007-2008, 2008-2009) and 1 UEFA Champions League (2007-2008) and the FIFA World Player of the Year award in 2008. 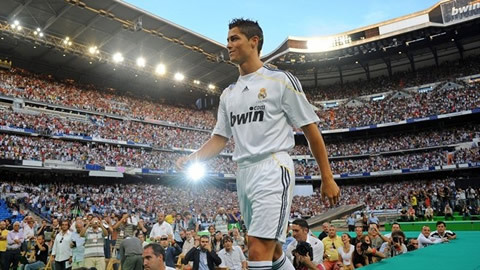 In 2009, he would make history once more, by becoming the World's most expensive football player involved in a transfer, after moving from Manchester United to Real Madrid for a transfer fee around 94 million euros (80 million British pounds or 132 million U.S. Dollars). Cristiano Ronaldo is now still playing for Real Madrid and he's on his third consecutive season playing for the Merengues. CR7 also has the biggest buyout clause (transfer release clause) in football's history, evaluated at 1 billion euros. However, Ronaldo has already admitted for several occasions that he loves playing for Real Madrid, since that was one of his childhood dreams.